If you’re a massive fan of the British label Alexander McQueen and also just so happen to love a good piece of fine art, then you’re going to love McQueen’s latest collaboration. Set to launch online and in selected stores on November 15, the label has teamed up with leading artist Damien Hirst. The artist has played with the brand’s iconic skull motif and reworked it to create his own very much covetable patterns. 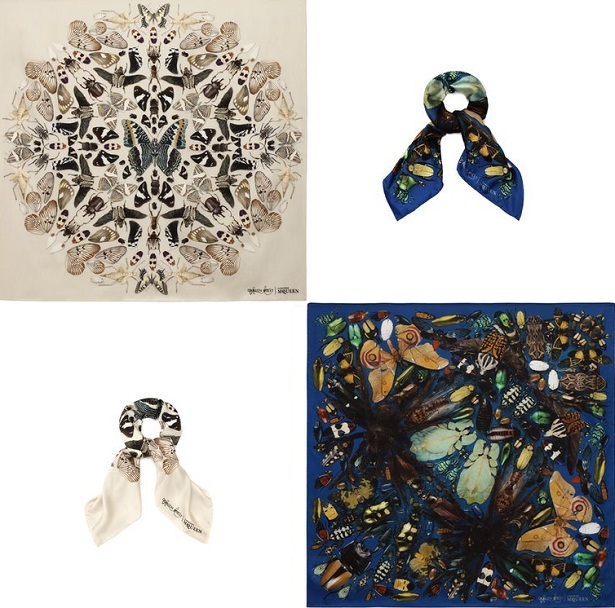 Mixing his iconic butterfly and insect patterns within the prints, they are definitely eye catching pieces that’ll get snapped up straight away. Check out all the pieces in advance of the launch at alexandermcqueen.com. In association with the launch, they’ve also shot a cool promotional video shot by fashion photographer Solve Sundsbo featuring faceless models draped in the new scarves. More Proof That Miranda Kerr Photoshops Her Instagram Pictures?What Are These Antonio Berardi Pieces Doing at the Victoria’s Secret Show?